We Bought A Zoo! is a friendly little movie released in 2011, based on the memoirs of the same title by Benjamin Mee, who bought his own zoo in England. The movie transports the story to California and changes history in other ways to make a good movie. The always entertaining Cameron Crowe, (Almost Famous, Elizabethtown) directed the film and wrote the script from an earlier version by Aline Brosh McKenna. 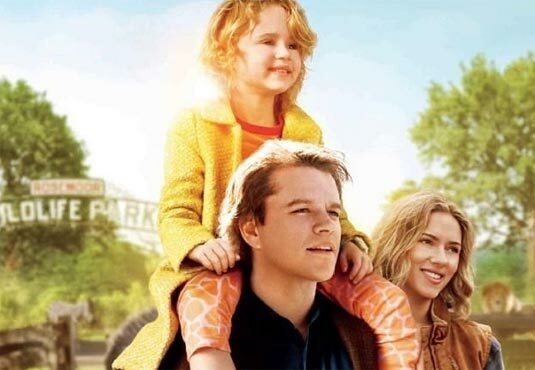 Benjamin Mee (Matt Damon) struggles to raise his two children, a 14 year old son, Dylan (Colin Ford), and a seven year old daughter, Rosie (Maggie Elizabeth Jones) after the death of his wife (Stephanie Szostak) from some abrupt disease (cancer?). Dylan can’t seem to cope and acts out at school, eventually getting expelled from school for theft. He is an aspiring artist and spends most of his time making violent and dark ink drawings. Rosie is well adapted to the loss, although she misses her mom and frequently asks Benjamin to tell her stories so she doesn’t forget. Like Dylan, Benjamin cannot deal with the loss. Frustrated, he quits his job as an adventure and travel writer—over the objections of his brother, Duncan (Thomas Haden Church)—and begins to look for a house more isolated from the city. After looking at a number of houses with Rosie, they are steered to a country property by a novice realtor (J.B. Smoove). There is just one catch: it is a zoo and ownership of the property includes continued maintenance of the zoo. Benjamin is very reluctant, but seeing Rosie with a flock of peacocks changes his mind and he invests his entire savings in the project, with the goal of re-opening the zoo on July 7. Rosie is enthralled and remarks several times with great charm, “We bought a zoo!” This zoo comes with attendants, of course. The woman in charge is young Kelly Foster (Scarlett Johansson), who is not professionally trained, but advanced through the ranks to get her job. There is a designer, Peter MacCreedy (Angus Macfadyen), a carpenter, Robin (Patrick Fugit), and Kelly’s 13 year old home-schooled cousin, Lily (Elle Fanning), who takes a shine to Dylan. There are, of course, complications, not the least of which is Dylan’s continuing funk and Benjamin’s own frustrations. An inspector, Walt Ferris (John Michael Higgins) adds to their woes by presenting an expensive list of improvements that must be made before the zoo can open. Tapped out, Benjamin begins to think that the project might ultimately fail. The movie punches all the right buttons. The potential overdose of sugary sweetness is balanced by Benjamin and Dylan’s conflict and their grief over the loss of Mrs. Mee, but there’s still a lot of sugar. And eye-candy. Matt Damon is terrific, handsome, likeable, and extremely empathetic and so is Colin Ford. Of course, there is also the great beauty of Scarlet Johansson and Elle Fanning. Johansson is very believable and empathetic as Kelly. Those who aren’t beautiful are odd looking goofballs, such as Church, Smoove, and Higgins. At times, a little directorial discretion regarding these comedians might have helped the film. Crowe also indulges himself profusely in the “cute” factor, not only with the character of Rosie, but in a great many shots of the zoo animals. Maggie Elizabeth Jones is at times almost unbearably cute, but she never fails to delight and shows a great deal of acting skills for a child. It’s a very good movie for kids and for the family. I love cute little girls, sympathetic plot lines, beautiful people, and animals, but I also have great sympathy for those who lose loved ones to cancer, so I bought the movie, hook, line, and sinker. I would gladly see it over and over, because it is a really entertaining “feel-good” movie. Just remember, “20 seconds of courage” can change your life!